Christmas racing preview, Tue 23 Dec at 21:30 GMT, BBC Radio 5 live. Also there will be commentary and all the news of the Kempton feature races on BBC Radio 5 live on Fri Dec 26. 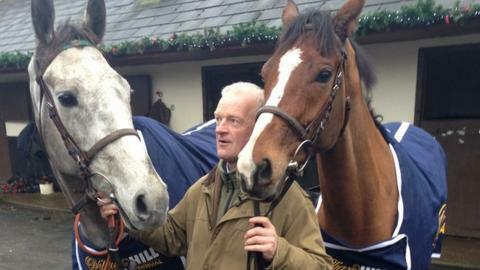 There's no mistaking the time of year at the sprawling headquarters of Ireland's champion jumps trainer Willie Mullins. The stables are lined with Christmas lights, the tree at the centre of the yard is bedecked with festive baubles and on the day I'm there most of the staff are wearing Santa outfits. Meanwhile the trainer's office positively buzzes with plans for horses, grooms and jockeys, and their various arrangements, during the bumper holiday racing programme. Heading the powerful raiding party emerging from Closutton, County Carlow are Champagne Fever and Faugheen, fancied to deliver a Boxing Day double at Kempton's William Hill Winter Festival. However, while much of the talk is of 'Champagne', Mullins is hardly fizzing with festive comfort and joy as he considers the challenge of the grey-coloured seven-year-old on the £200,000 King George VI Chase, jump racing's mid-season championship. And there's a similarly cautious tone when discussing the big-race prospects of Faugheen, due to contest Kempton's Christmas Hurdle, worth £100,000. "The reality is it's a fair question to ask the horse, with his experience; we're biting off a lot going to the King George. "There's a lovely graduation race at Ascot just before Christmas which would suit him far better, with a lot less opposition, but he might as well go to Kempton. "I know when we went across there the first time with Florida Pearl, we went across full of enthusiasm, and thought we were going to be very close. "We were second [behind First Gold, 2000], but learnt some valuable lessons we were able to use the following year when he won. You sometimes have to lose a final to win a final, I think." "We're hoping to blow all that aside this time, but there's no point me building myself up, building you guys [in the media] up and building punters up. To me, we have a fair hill to climb." Mullins' number one jockey, Ruby Walsh, winner of a record-breaking five King Georges on Kauto Star, is set to partner Champagne Fever, currently rated second favourite behind last year's winner Silviniaco Conti. Walsh is also expected to be ride Faugheen, an impressive winner at Ascot in November. Faugheen is now unbeaten in eight starts (including a point-to-point), including races at the 2014 Cheltenham and Punchestown festivals. Currently, he tops the reckoning - along with Britain's The New One - for the Champion Hurdle back at Cheltenham in March. Mullins, who also has dual champion - and hurdling legend - Hurricane Fly under his care, expresses surprise at Faugheen's progress. "It's extraordinary because I think he won a point-to-point very late in the season, and I'm not sure he has a pedigree that suggests he's be a Champion Hurdle favourite. "It's been a huge leap. To look at him last year, there didn't seem to be anything there: he was skin and bone. "This year he's come back and he could be a hundredweight heavier. I was really worried about him going to Ascot - could he win with the size of him? "If he can do that with that sort of condition, there must be a lot of improvement in him, but it's another big step up." With The New One believed to be unlikely to run, Faugheen's principal opponent in the two-mile feature is set to be the Paul Nicholls-trained Irving. Irving's supporters believe a race that puts an emphasis on speed might not suit Faugheen, who possesses stamina aplenty, as evidenced by a success over a mile further on heavy going at Christmas in 2013. Mullins acknowledged the point, but says the horse was asked to go further a year ago because the stable has so many youngsters that they sometimes have to take unexpected routes to avoid each other. All of which brings us onto the vast string's dominance in Ireland, and the possibility of an increase in the number of raids across the Irish Sea. While he's won 33 races at Cheltenham Festival, the 58-year-old's numbers elsewhere are actually not out of the ordinary. "My first objective is to be good here if I can," he explained, "and then we'll look abroad, but I can't see myself bringing my top horses to England before they'd run in the Grade Ones in Ireland." "At the present time it's not my plan - it might change."